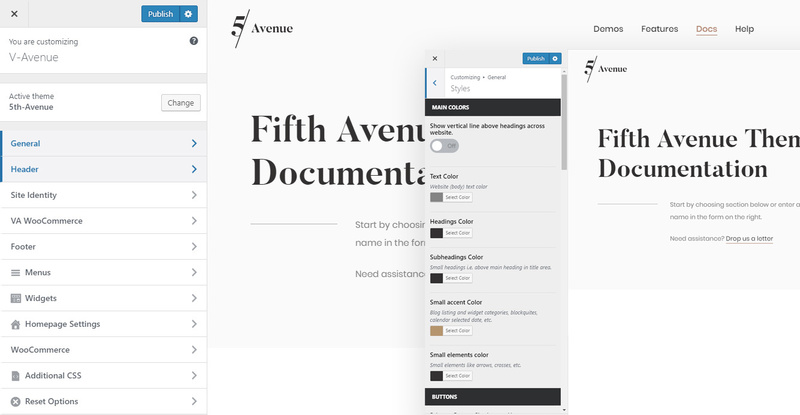 Fifth avenue comes with the powerful options panel that allows you change the functionality and layout of your site. To Access the options panel head to the 5th Avenue menu link in your WordPress admin dashboard. All of these options are global, meaning they will effect the entire website. Color and style settings are located in WordPress Customizer. Our theme comes with a lot of color & style options and allow you drastically change the look of your website without ever touching a line of code. To open customizer navigate to Appearance – Customize in your WordPress admin panel. You can also find customizer link in the top bar (if it is enabled) when you are logged in and browsing your website.